Around 1300 BC, a Bronze Age community living close to a rich wetland area near what is now Peterborough decided to build a massive wooden causeway leading from a point on dry land (now known as Fengate) across the marshy pools and waterways to a natural island about a kilometre out. 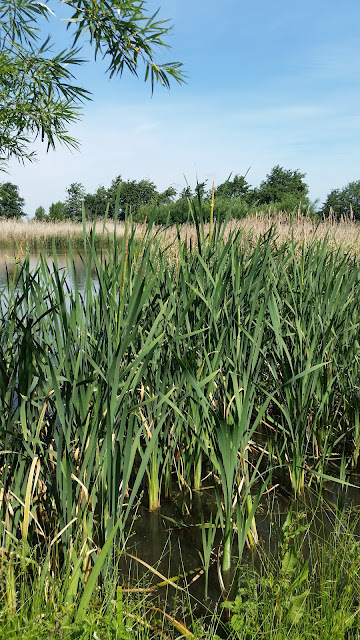 The causeway was constructed as five long rows of tall sharpened stakes driven into the marsh, with a criss-cross of timbers and brushwood laid between them on which people could walk. It's been estimated over 60,000 individual timbers were used to build the causeway, which followed the line of an earlier, Neolithic track - but the low-lying areas around the island were gradually becoming inundated. The site, known as Flag Fen, was discovered in 1982 by the archeologist Francis Pryor (well known to fans of the popular archeology show Time Team). Archeological investigation has been going at Flag Fen ever since, and there is now a fascinating museum and visitor centre. I’ve long wanted to go there, and my wish came true one bright sunny day a few months ago. People lived on the margins of the fen in roundhouses like this one, farming, hunting and fishing. 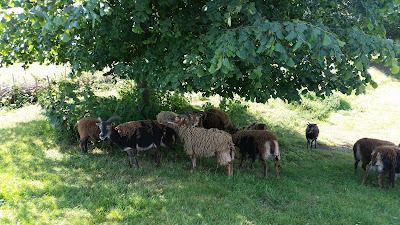 They kept sheep, an ancient breed similar to these in the picture below, which were trotting loose about the rural site. 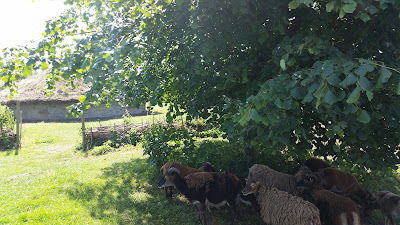 The day I was there, house-martins were flying like darts in and out of the roundhouse, working away to feed their young, who were peeking shyly out of the mud nests plastered to the beams. I wonder if this would have happened in 1300 BC when the fire would have been continually smoking? Perhaps the martins would have built their nests under the shaggy eaves. Anyway, within these snug., safe houses - Francis Pryor has described how during the great storm of 1987 he stood in the doorway of the first reconstructed roundhouse on this site, watching sheet-metal roofs tear loose and blow away from the nearby industrial site - our Bronze Age ancestors lived and worked, and, setting out along the causeway they had built, performed ceremonies and made ritual offerings to the waters. The acid, anaerobic peaty waters don’t preserve bones very well, but they are excellent for preserving wood, leather, and metal. 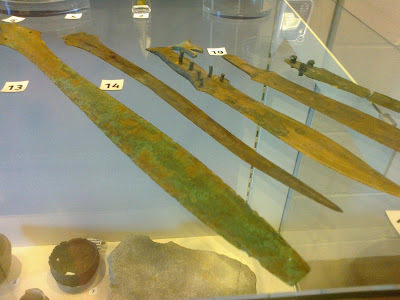 Many bronze swords and spearheads were given to the marsh; gold earrings, pins and brooches have also been found. To whom or what were these dedicated? Perhaps to the dead, the ancestors – there are burial mounds on the island – or perhaps to the spirits of the water and the wild. We may guess; probably we will never know. There's even a section of excavated causeway visible in situ, albeit housed for protection inside a hut where it's kept from drying out (and therefore crumbling into dust) by a constantly dripping sprinkler system. To stand looking down on the actual timbers which prehistoric people once trod is fascinating even if not, in such a context, terribly romantic. However the photo below doesn't show that the concrete walls of the hut have been painted with trompe l'oeil murals of the prehistoric fen in spring, summer, autumn and winter, stretching away to the horizon, populated with gulls and herons and moorhens and wild ducks. The post alignment is indeed a causeway, but it’s far more than that. The main evidence for this is provided by the nearly three hundred finds of prehistoric metalwork made to date. They were found within the area of the posts, and also along their southern side, but not along the northern side which faced ‘out’ ... into the wide-open fen. It’s tempting to view this in symbolic terms: the open fen to the north was seen as being hostile or untamed. It was on this side of the posts that we found the remains of dogs, and the only complete human skeleton. They were in extremely poor condition after lying for thousands of years in the acid peat ... but I reckon the death occurred in the Iron Age – a period when Flag Fen was still in use as an important ceremonial centre. Given what we know about the so-called ‘bog bodies’ of Britain and Scandinavia in the Iron Age, I wouldn’t be at all surprised to learn that the individual [and dogs] had been killed before being thrown into the waters. Here, above and below, are some of the many beautifully preserved sword blades, and wooden tools. It’s obvious that prehistoric people used wood for many purposes – as handles and hafts for axes, picks and wooden hammers, and shafts for spears – but wood rots easily, and finds such as these are amazingly rare. 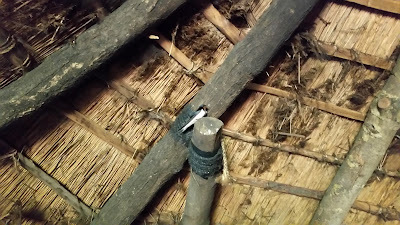 Even more exciting, the museum houses a collection of no less than eight prehistoric log boats, all more or less intact, some with carved decorations and even lifting handles, discovered at a nearby site called Must Farm. 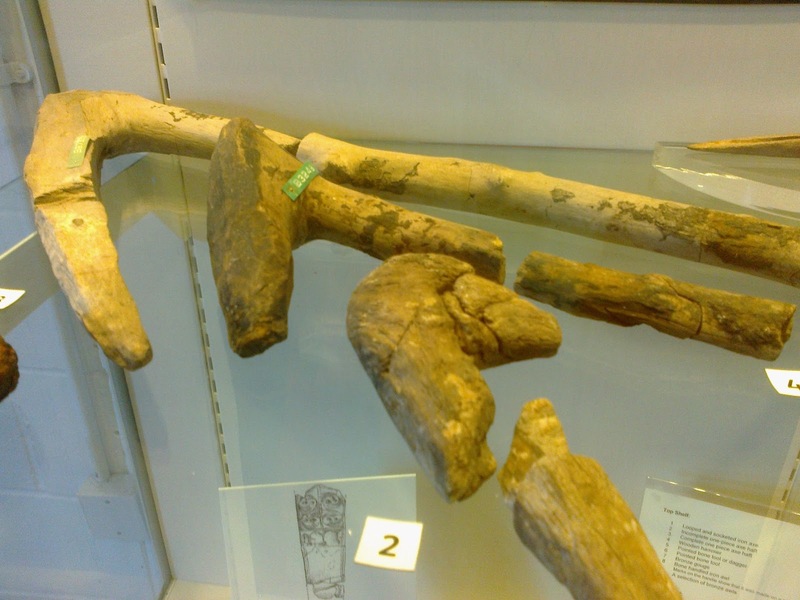 These are in the process of being preserved, like the Mary Rose. Thanks for this - I hadn't realised there was so much to see. I really would like to see the place. 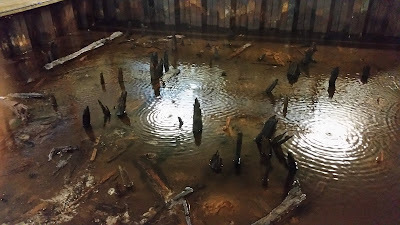 Do, if you can, Sue - and in King's Lynn museum they have Seahenge! Me, too. I knew about it, but had the impression that it was not open to the public and there was nothing much to see. I'd love to go there. Lovely photos! Thank you for the marvellous overview! I’m about to head south from the Orkneys and Flag Fen is now on the list of destinations! Thanks for this. 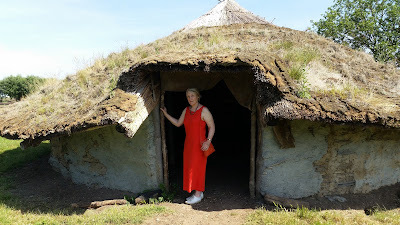 I have heard of Flag Fen, but thought it was just an archeological site, and hadn't realised there was a visitor centre. I am visiting Norfolk next May, and hope to be near enough to visit. How amazing! I must go. I've been meaning to go for years! Thanks for this. It is an amazing place. Looks like you got some better weather than when I was there a few years back! All those of you saying you've been 'meaning to go', really just do it! An enjoyable and inspiring read! I did visit circa Autumn 2012, but alas it was closed! But you've made me want to go again when I know it's open!